Phenylacetic acid (PAA) (conjugate base phenylacetate), also known by various synonyms, is an organic compound containing a phenyl functional group and a carboxylic acid functional group. It is a white solid with a strong honey-like odor. Endogeneously, it is a catabolite of phenylalanine. As a commercial chemical, because it can be used in the illicit production of phenylacetone (used in the manufacture of substituted amphetamines), it is subject to controls in countries including the United States and China. Synonyms include α-toluic acid, benzeneacetic acid, alpha tolylic acid, 2-phenylacetic acid, and β-phenylacetic acid. 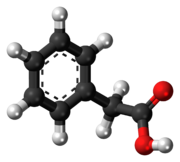 Phenylacetic acid has been found to be an active auxin (a type of plant hormone), found predominantly in fruits. However, its effect is much weaker than the effect of the basic auxin molecule indole-3-acetic acid. In addition the molecule is naturally produced by the metapleural gland of most ant species and used as an antimicrobial. It is also the oxidation product of phenethylamine in humans following metabolism by monoamine oxidase and subsequent metabolism of the intermediate product, phenylacetaldehyde, by the aldehyde dehydrogenase enzyme; these enzymes are also found in many other organisms. Phenylacetic acid is used in some perfumes, as it possesses a honey-like odor even in low concentrations. It is also used in penicillin G production and diclofenac production. It is also employed to treat type II hyperammonemia to help reduce the amounts of ammonia in a patient's bloodstream by forming phenylacetyl-CoA, which then reacts with nitrogen-rich glutamine to form phenylacetylglutamine. This compound is then excreted from the patient's body. It's also used in the illicit production of phenylacetone, which is used in the manufacture of methamphetamine. Phenylacetic acid is used in the preparation of several pharmaceutical drugs, including camylofin, bendazol, triafungin, phenacemide, lorcainide, phenindione, and cyclopentolate. ^ "List of Regulated Drug Precursor Chemicals in China". Archived from the original on 17 August 2015. Retrieved 27 April 2015. ^ Wightman, F.; Lighty, D. L. (1982). "Identification of phenylacetic acid as a natural auxin in the shoots of higher plants". Physiologia Plantarum. 55 (1): 17–24. doi:10.1111/j.1399-3054.1982.tb00278.x. This page was last edited on 10 January 2019, at 14:33 (UTC).